Yes, a nurse is what I said I wanted to be for many of my developmental years. In third grade, I checked out a lot of biographical books from my school library. Two of them were on the lives of Clara Barton (the pioneer nurse who also founded the American Red Cross), (1821-1912) and Florence Nightingale, (a celebrated English social reformer and statistician, and the founder of modern nursing, (1820-1910). Yet, throughout my youth, my parents stressed the importance of marrying and raising a family–“that’s what women are meant to do,” they said. I’m not sure how so many parents of our baby boomer generation got caught up in such nonsense, especially since these parents were the same people who had to adapt traditional male and female roles during the Great Depression and World War II. Or, perhaps, it was because they had so many struggles during these times that they couldn’t see the opportunities and possibilities. Susan Dimock (1847-1875) is a 19th Century achiever who on August 20, 1872, became the resident physician at the New England Hospital for Women and Children in Boston. Susan’s family came over on the Mayflower with the infamous Massachusetts’ Fuller’s and Lathrop’s and she is my cousin through these families intermarriages. Her parents were Henry Dimock (a newspaper journalist) and Mary Malvina Owens of Washington, NC. Sunday finds me safely through with last week’s Herculean labors. You know I had a hundred formalities to go through with, and with no German to speak of. Looking back upon it, I do not see how I managed it; however it is all plain sailing now, and I have nothing to do except listen to lectures, study hard, and learn German, etc. Oh, it is so nice to get here, at a word, what I have been begging for in Boston for three years. I have every medical advantage that I can desire. I told the professor of anatomy, for instance, that I wanted a great deal of dissecting; and he immediately bowed, and said so kindly, “You shall have it; I only desire you shall tell me what you prefer.” And so it is with everything. . . in every respect I have equal advantages with the young men; and then I find also the warmth and protection and feeling of interest which a young man finds in a university. It was July 1872, when Dr. Dimock returned from medical school in Europe. She attended there because Europe was less hostile to women becoming doctors. She remained three years at the New England Hospital. There, she handled day-to-day patient management and care while also performing surgeries. But her best contribution in the field of medicine was to start a program to improve patient care through improved training of their nurse caregivers. As student nurses, they worked in the wards and attended medical lectures and studied anatomy. In between her studies and teachings Susan liked to travel. Unfortunately, she died at age 28 on board the steamship “Schiller” that struck the Scilly Rocks in fog and sunk near the coast of Cornwall, England. 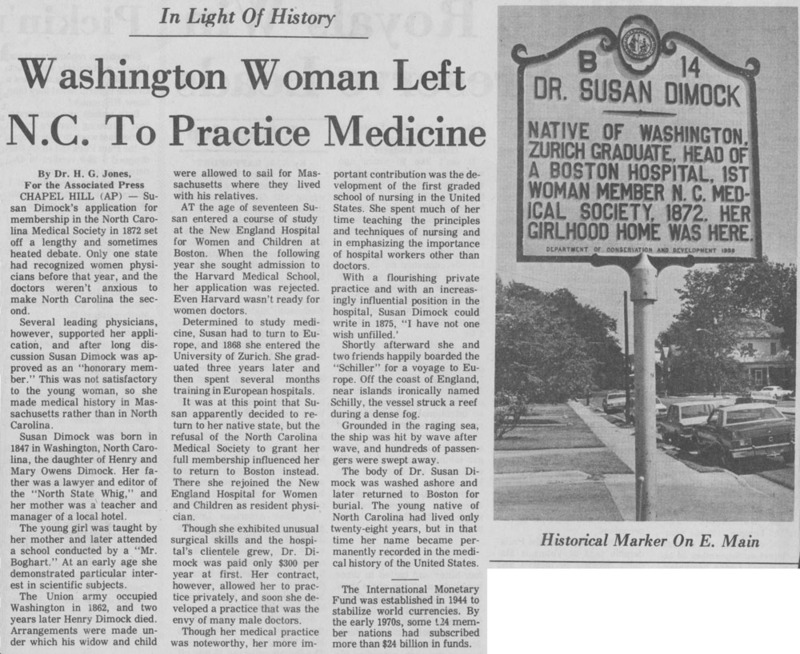 Pioneering activists and professionals in medicine, women’s healthcare and women’s professional education, including Dr. Marie Zakrzewska, surgeon Susan Dimock, and America’s first trained nurse, Linda Richards. In 1996, the marble marker at her Boston grave was replaced with a more durable granite duplicate, and the original moved to her home town of Washington, NC, where it was erected as a cenotaph. Well into the nineteenth century, nursing was considered undesirable and menial work, suitable only for women whose circumstances left them no better options for supporting themselves. It took Florence Nightingale many years to convince her family to allow her to study nursing. She trained in Germany before returning to London to take up her profession. Britain’s involvement in the Crimean War (1854-1856) gave her the chance to demonstrate the benefits of having nurses in military hospitals, but first she had to overcome doctors’ opposition to the presence of women in the wards. Once she did, she quickly earned the respect and gratitude of the soldiers and in time their families. After the war, contributions from a grateful public enabled Nightingale to start the first nurses training school at a London hospital. Meanwhile, in Washington, North Carolina, a young Susan Dimock was borrowing anatomy books from the family doctor and accompanying him on his calls. The Civil War disrupted her education — the local academy she was attending closed — and her family life. Her father died, and most of the family property was lost. In 1864 17-year-old Susan and her widowed mother joined relatives in Sterling, Massachusetts. A year later, Susan took a job teaching school in Hopkinton. She spent her evenings poring over medical books recommended by Dr. Marie Zakrzewska, the founder and head physician at the New England Hospital for Women and Children. Zakrewska had helped to establish the New York Infirmary for Women and Children, the first institution in the world devoted to the care of women and children. Female doctors and surgeons directed the hospital and tended all the patients. In 1862 “Dr. Zak,” as she was known, moved to Boston and founded the New England Hospital for Women and Children. In 1865 Susan Dimock finally persuaded her mother to allow her to study medicine. 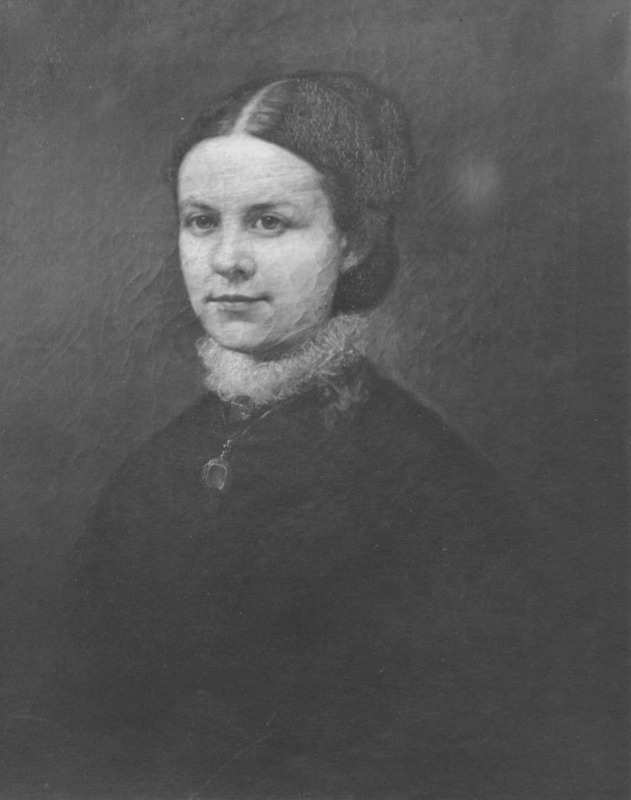 In January of 1866, a few months shy of her 19th birthday, she arrived at the New England Hospital as a medical student. Although Harvard, like almost every other American medical school, refused to admit women, it did allow women “under certain restrictions” to follow doctors on their rounds. This increased Susan Dimock’s determination to obtain a medical degree. She decided to go to Europe, where medical schools were more welcoming of women students than those in the U.S. In 1868,with help from her mother, Dr. Zak, and several Boston philanthropists, she began studying medicine at the University of Zurich in Switzerland. In between her studies, she traveled. She visited Florence Nightingale in London and observed her nursing education program. She spent time at Kaiserswerth, Germany, where Nightingale had been trained. She returned to Boston in the summer of 1872 eager to put her knowledge and newly acquired medical degree to use. She accepted a three-year appointment at the New England Hospital for Women and Children, where she set out to reorganize the training program for nurses. Hospitals traditionally viewed student nurses as a source of cheap labor. They took no classes but learned on the job, by following instructions they received on the ward. After the Civil War, doctors began exercising more oversight of nurses’ training. All but a handful of American doctors were men, and they had no expectation (or wish) that nurses would make independent judgments or carry out tasks on their own. Thanks to Florence Nightingale, however, Susan Dimock saw things differently. “No man, not even a doctor,” Nightingale once observed, “ever gives any other definition of what a nurse should be than this – devoted and obedient. This definition would do just as well for a porter. It might even do for a horse. It will not do for a nurse.” Nightingale believed that the nurse had a special role as a health care provider and hospital administrator, and that her education should prepare her for that role. Dimock agreed with Nightingale — up to a point. She understood and was eager to lower the obstacles nurses faced to gaining knowledge, credentials, and respect; but as a doctor herself, she also understood the value of the nurse’s traditional role. Florence Nightingale saw nurses in training as students, not workers; Susan Dimock believed they could be both. After Susan Dimock’s sudden death at sea in 1875, friends and admirers endowed a “free bed” for indigent patients in her name at the New England Hospital for Women and Children. Today the hospital is home to the Dimock Community Health Center in Roxbury, MA.